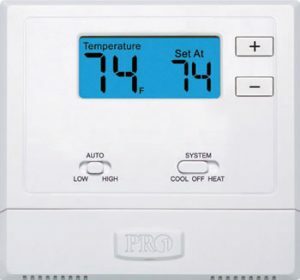 PTAC Thermostat – Breeden & Silver Distribution Corp. The T631W-2 was designed specifically for PTAC units. This thermostat has a 5 year warranty, and works on battery or 24V. It features a large temperature and set point display with a highly visible blue backlit screen. Heating and cooling set points can also be limited. Each T631W-2 comes witht the wall mount thermostat and a receiver module that attaches to the PTAC. Can be used with most PTAC units with digital controls. Breeden & Silver has been in business since 1992 as a supplier of PTAC units, parts and accessories.